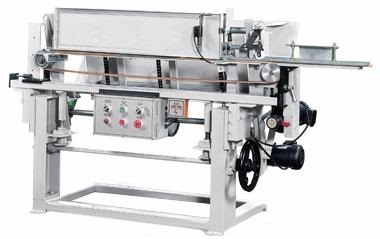 Designed and built well-suited for automatic feeding workpiece materials such as wood bar, acrylic, bakelite and metal bar, etc. Conventional trouble as feed speed not synchronized, easy wear on conveyor belt, or low production efficiency. Now all trouble can be fully resolved with the SD-AM Automatic Round Rod Feeder. Easy synchronized speed adjustment by simply turning speed adjustment knob. While SD-AM attached to two or more Round Rod Sanding Machine (SD-210, SD-220) what the operator needs to do is load stick into the hopper loader. The machine will perform completely automatic sanding operation. Thus. allowing one operator to attend to more machines. While SD-AM is in application with Wood Bead Lathe, it helps the lathe to increase production efficiency in dead turning operations. Flat conveyor belt eliminates troublesome centering problem.